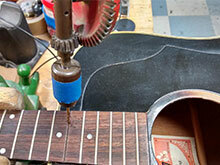 New Englands Premier Instrument Repair Shop! 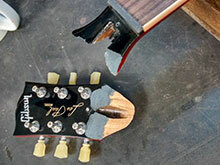 New Englands finest technicians to care for your guitar. 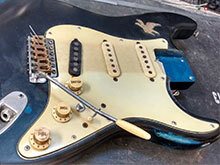 From basic setups to broken guitar necks we can bring any instrument back to life. Amplifier problems can be tricky. Luckily we have many years of experience to solve any amp repair problem. Or if you simply need tubes replaced we can do that too! Keyboards, amps, effects, you name the issue and we most likely have seen it and can get you back on track! Brand new damaged in Shipping, Doug and the Techs are on it! 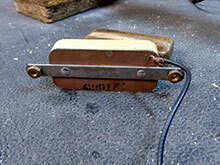 This old Kay pickup was dead with no output. Restored to its former glory and then some! 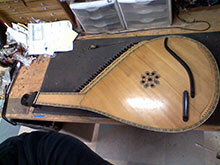 A Ukrainian Bandura in for crack repairs and a full set of new strings ordered from the Ukrain. 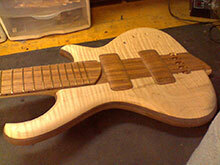 it's played like a harp ands a bit like a harpsichord or a hammer dulcimer. It's not all amps and guitars up here at The Music Techs. 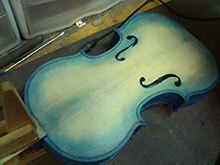 Check out this Violin that Doug turned into a show stopper! A customer actually made this and did an excellent job. He didn't have experience with doing the finish including the expense of supplies and equipment so he asked us to help. 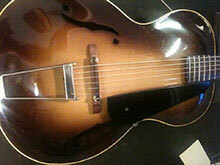 Recently a nice 1930s Epiphone master built zenith came into the shop. We gave it some needed tlc...playing great now!